There are many things to think about before you head out on the water in command of your own boat for the very first time. We have previously discussed theory and practical training courses, but one course you will need to do before you take to the high seas is your VHF Radio Licence. Before mobile phones, radio was the only form of contact between boats whilst out sailing and it is still the primary means of raising the alarm in an emergency situation, which is why it is important to know your radio etiquette. 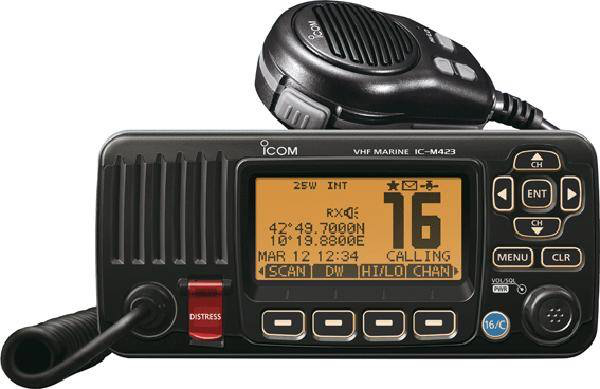 Each VHF channel has a purpose, some should only be used for specific reasons, whilst others are not accessible at all to small vessels, such as a sailing or motor yachts. Ch. 16 – This channel is monitored by Coast Guard services and all shipping. Small vessels should also maintain a watch on 16. This channel should be used for hailing and emergencies only, definitely not for radio checks or general chit chat! Ch. 12 – Many UK harbour authorities use this channel to co-ordinate safe passage of shipping. The UK Coastguard uses channels 10, 23, 67, 73, 84 and 86. You will need to check which the correct channel is for the area that you are going to be sailing in, for instance, Solent Coast Guard operates on channel 67. UK marinas generally use channel 80, but some also use channel 37. There are certain words that are used during conversations over the radio which have specific meanings. If you were a fan of The Dam Busters, you may remember Roger, Wilco and Out, although Wilco isn’t a word you will hear used on marine radio. Over and Out should not be used! (It’s a contradiction in terms), if you do this on flotilla holidays or with sailing clubs, you may end up buying everyone an ice cream or beer at the end of the day!!! A Mayday call should only be used if there is grave and imminent danger to life or your boat, for instance, someone on board is seriously injured or the boat is about to sink. All boats should display a card by the radio with the Mayday procedure clearly written so that it is easy to say it over the radio even when you are in the middle of a horrible situation. When you do your VHF course, you will practice putting out a Mayday call on special radios which don’t transmit to the whole world. It is incredibly important that when practicing with a real radio, that you make sure it is turned off! The Coastguard takes a dim view of those who abuse the Mayday call. The word Mayday comes from the French m’aidez (help me!) and was chosen in 1923 by a senior radio officer at Croydon Airport as a word that could be clearly understood in an emergency situation by all pilots and ground staff. It is always spoken 3 times (Mayday-Mayday-Mayday) to prevent mistaking similar sounding words. At FlexiSail, we include a VHF course as part of your training package and your instructor will make sure that you get time on the radio to practice your skills. If you are an experienced sailor, but don’t have your VHF licence, you can also do it through us with one of our shore-based training partners.